Google's Doodles have been brainier lately, and Wednesday's Doodle is no exception. 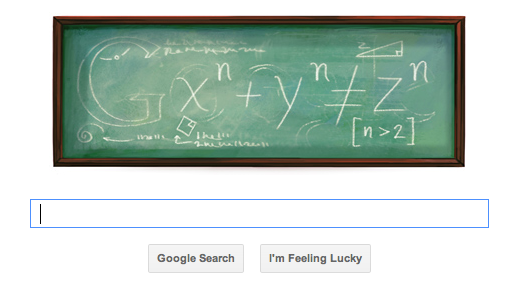 The doodle features a mathematical equation scribbled onto a chalkboard over the "erased" Google logo. What is this equation: x^n + y^n = z^n? If you're a math geek, you'll know it as Fermat's Last Theorem. Wednesday is the 410th birthday of the formula's creator, Pierre de Fermat. It is called his "last" because it was found in the margins of his copy of the ancient Greek mathematical text Arithmetica after his death, and was never proven by Fermat himself, or anybody else for matter for over 350 years. If you remember back to math class, you know with any formula there must be the proof to prove its validity. Fermat scribbled in the notes of that book that the proof would be too large to write there, but there's no evidence he ever completed that task. So why is Fermat so important? His contributions to math are considered significant, and range from work in the fields of calculus to the study of "number theory," which is the study of the properties of numbers. Are you confused? Here's the significance of Fermat according to Geek.com's Matthew Humphries. "Isaac Newton referred to Fermat's work when discussing his early ideas on calculus, he invented analytic geometry, worked on light refraction and optics, he researched the weight of the earth, and through correspondence with Pascal, had a direct impact on the theory of probability." Either way, Google has a little fun at Fermat's expense, pointing out his affinity for notes in the margins in the interactive portions of the Doodle. "I have discovered a truly marvelous proof of this theorem, which this doodle is too small to contain," the Doodle says if you mouse over it.